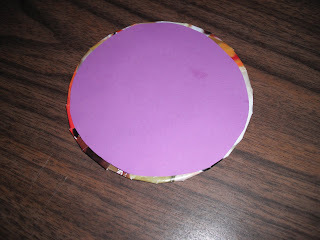 I am warning you, right here, in advance - My next craft involves cutting a circle. 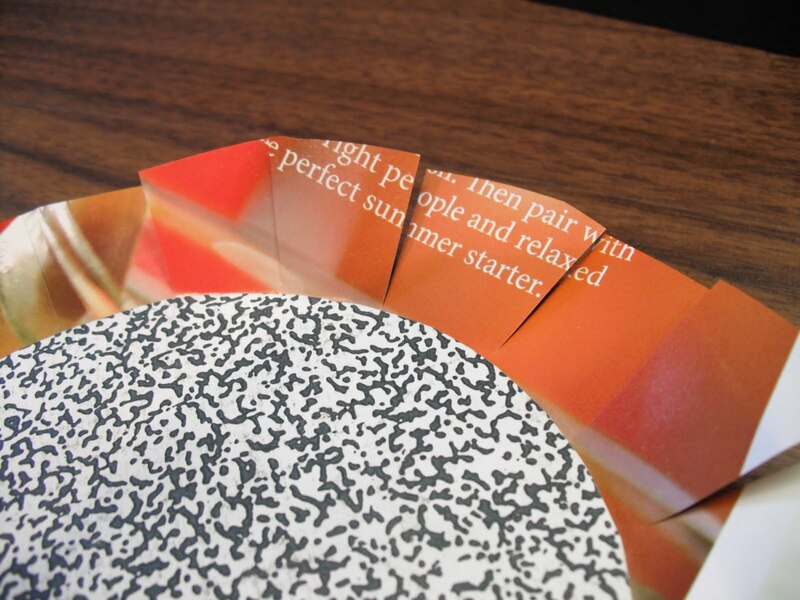 If you can't cut a circle with your scissors, you may want to back out now. With that said I can go ahead and continue. Today's craft in honor of Earth Day is once again inspired by crap things I have laying around me. This is a quick and easy craft that almost anyone will be able to do (other than those noted in the warning above). 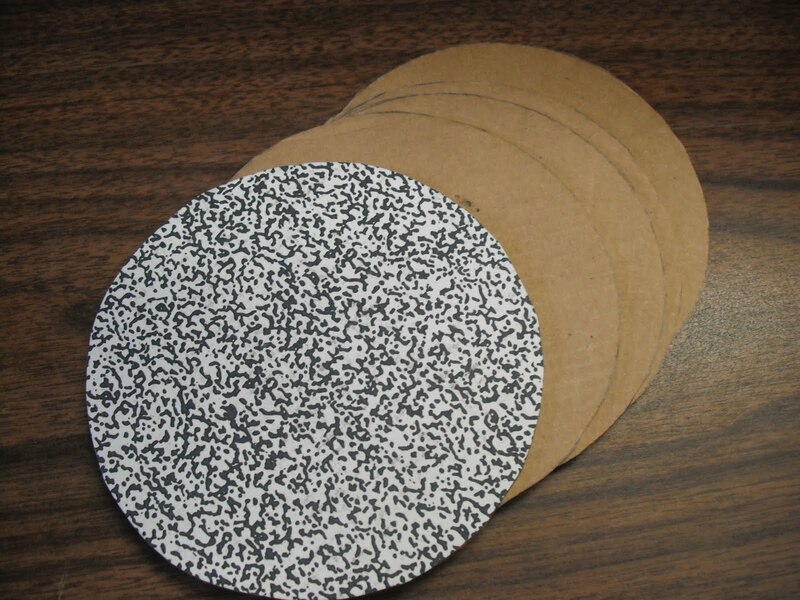 Take your 'circle maker' and trace the circles onto your cardboard or card stock. 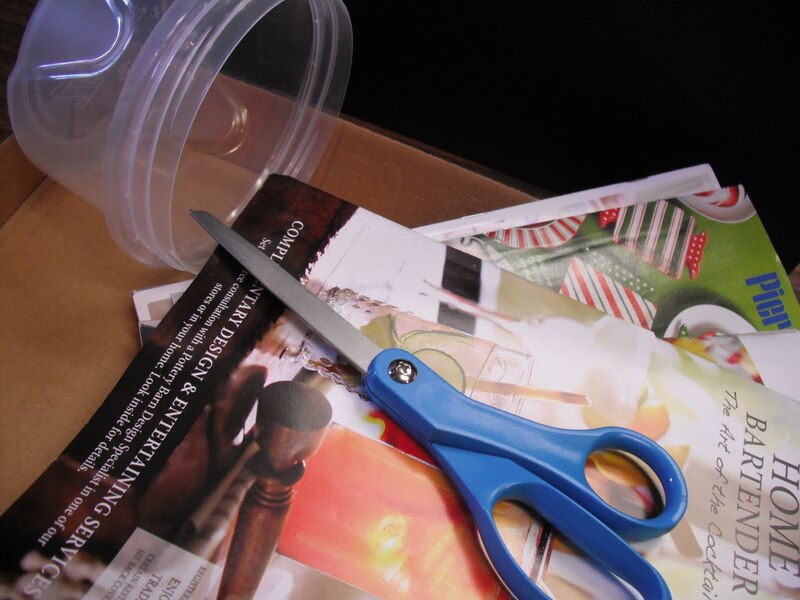 Cut out your circles with your scissors. Cut them a bit outside the tracing line for safe measure if you wish. You can always cut off more, but you can't add more on. My box top happens to have a patterned side to it. Next take your pages and cut a large circle out of them, larger than your coaster base is and glue the top of the coaster to the wrong side of the paper. Use your scissors to start cutting spokes into your paper circle. Do not cut all the way to the edge of the coaster base, leave about 1/8 inch or so space between. The more spokes you use the smoother an edge will be. This may take a bit of wiggling. 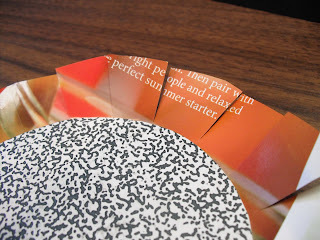 Then grab your mod podge and start folding over and gluing down your spokes. Do it a section at a time as you work otherwise you will end up with gluey fingers. 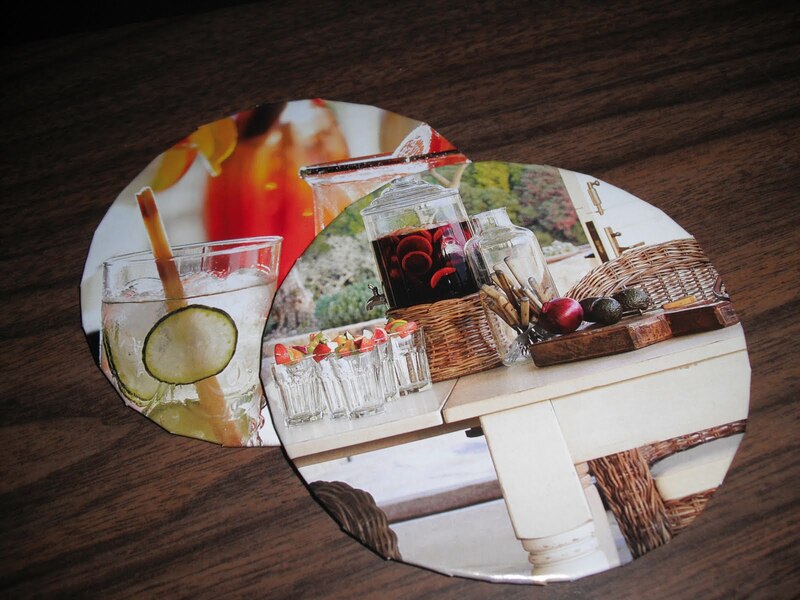 When you are done cut another circle, slightly smaller than the coaster and glue onto the back. 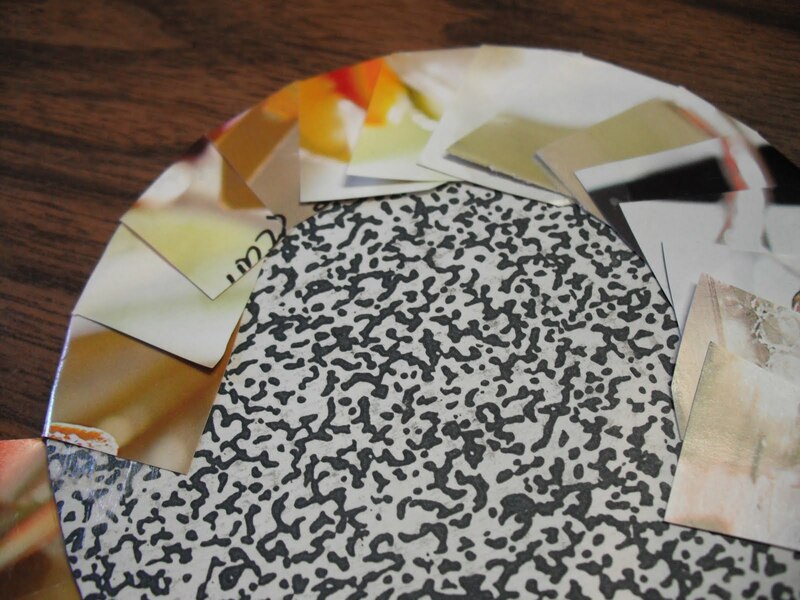 You can use another image or a scrap of paper from something else for the backside. This will clean up the side that will be facing down, towards your furniture. Seal all over with mod podge to finish. 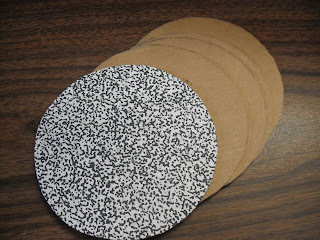 And there you have it, your very own recycled coasters using only a few items. You can jazz them up more with stickers, decoupage or rub-on letters/stencils before sealing if you wish and if you don't like the idea of paper on your table you could use a piece of felt for the bottom of your coaster. Just be sure to attach it after you seal the paper on the top. I hope you enjoyed today's craft. 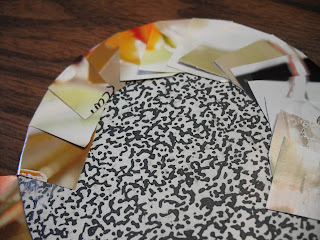 This is so quick and easy that you could make some for each holiday or season if you wanted. 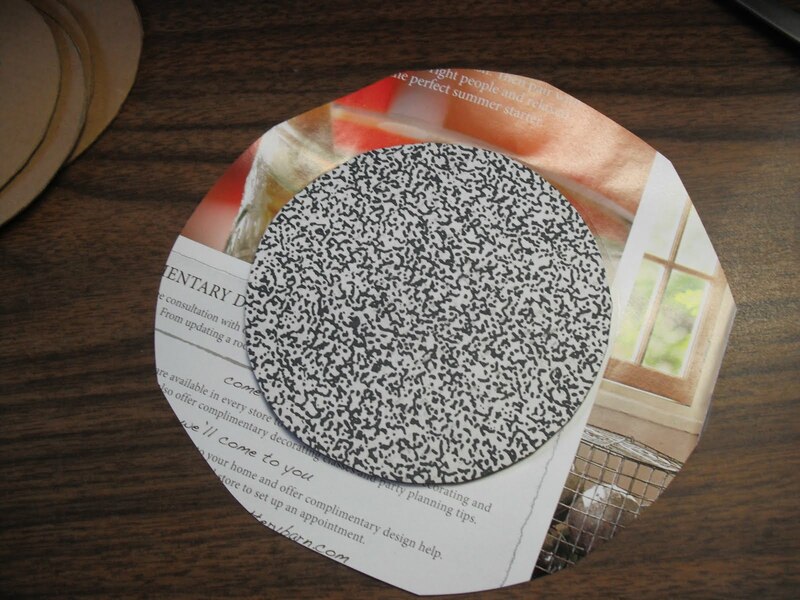 You could even use this to make personalized coasters as gifts. And, all joking aside, you can do with with other shapes as well. Not just circles. Squares are pretty easy to cut out.